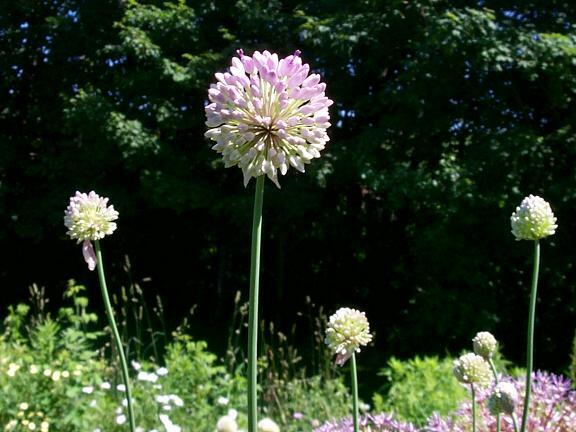 One of the largest and most important sections of the genus Allium is section Rhizirideum, or the rhizomatous onions. This group is characterized by species having poorly-developed or vestigial bulbs attached to distinct rhizomes. 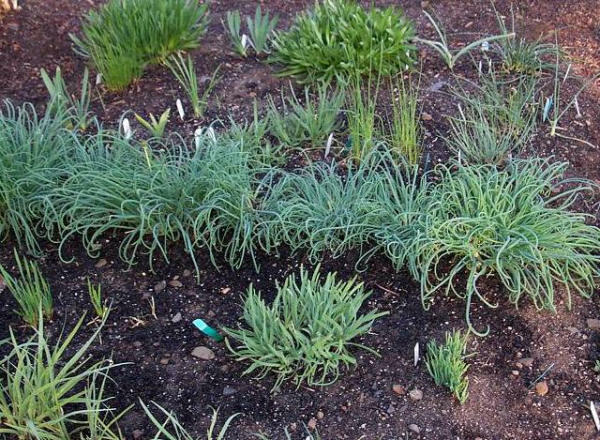 Generally speaking, rhizomatous onions are summer growing with season-long foliage, prefer more moist habitats than the summer-dormant bulbous species, and contain some of the most attractive and desirable species for gardens. 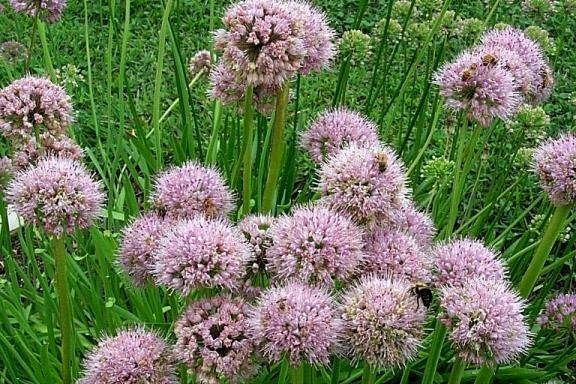 Allium albidum Fisch. Bulbs cylindrical to narrowly conical, clustered on a short rhizome. Stems 15-30 cm high. Leaves linear, 2- 4 mm wide. Flowers bowl-shaped to almost flat, 6-8 mm wide, white or yellowish, in dense hemispherical umbels 2-3 cm across, summer. 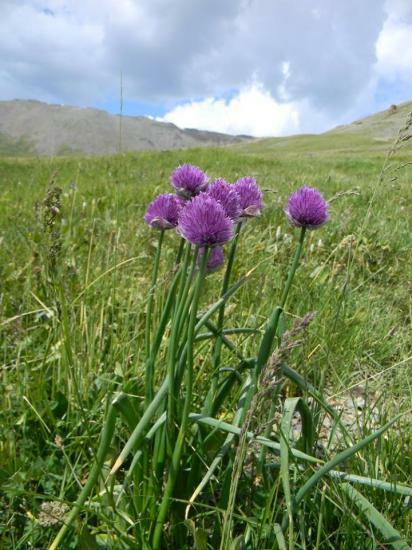 Bulgaria, Romania, European Russia, on stony sunny slopes to about 2000 m.
Allium albidum hybrid - The plant pictured is of one of the better seedlings resulting after several years of selecting among hybrid progeny derived from such species as A. nutans, A. senescens, and A. albidum, all of which freely hybridize with each other. This is one that shows a strong A. albidum influence, having smaller, tight heads of blooms, and very pale color, a sort of warm pinkish-white. With the shorter stems, even growth, and handsome clumps of shiny green strap leaves, it has great potential for further hybridizing. Photo by Mark McDonough. 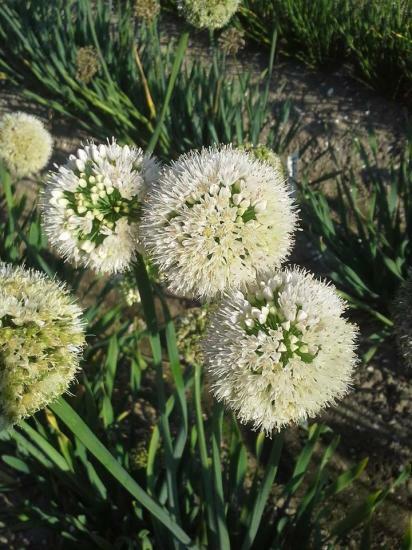 Allium albidum ssp. 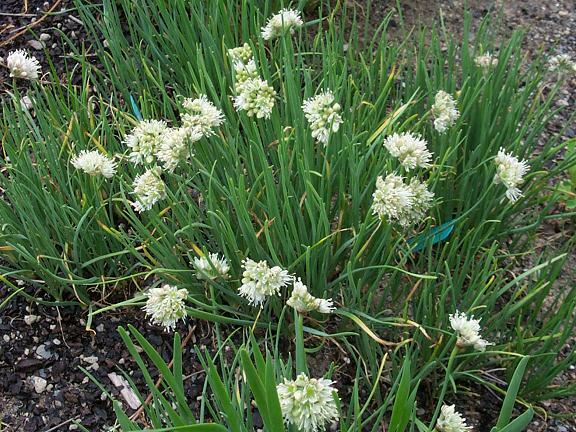 caucasicum is a nice compact form of this European mat-forming onion. 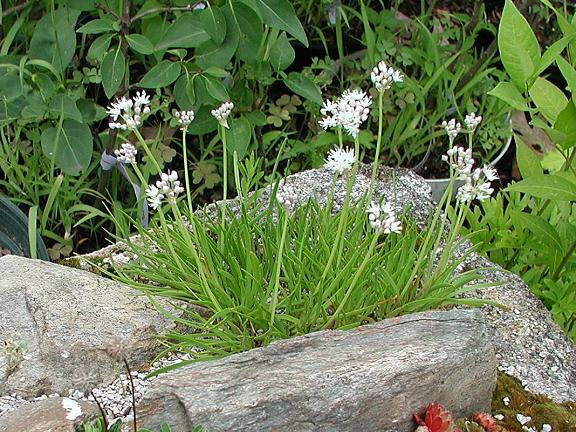 The small white flowers in July and August are particularly large, showy, or plentiful, but it's a pleasant enough little species that makes carpets of fine green strap-shaped foliage. It's small enough to grow in a trough, as shown in the image. Photos by Mark McDonough. 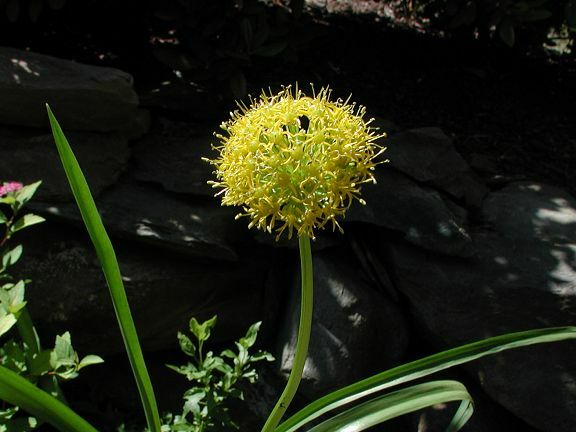 Allium carolinianum is not from Carolina at all, but a Himalayan species. It can be a difficult plant to please, and in most years the buds abort for some reason. 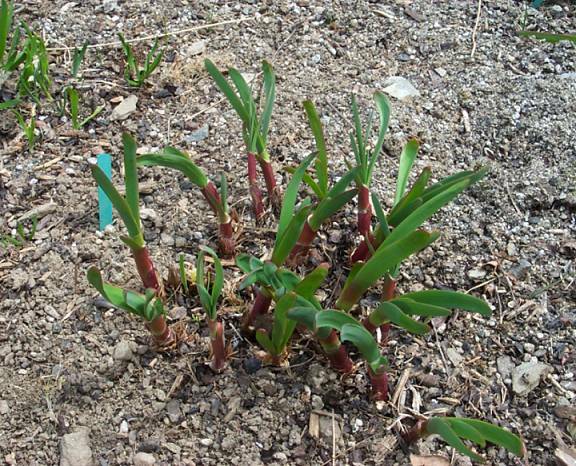 The foliage is quite remarkable, being very thick and waxy, particularly when first emerging. The first photo is early in the spring; the second was taken June 2002, when at least one of the buds was spared and condescended to flower. The plant is variable. I have grown better performing forms in the past, but alas over the years the others have perished. Photos by Mark McDonough. 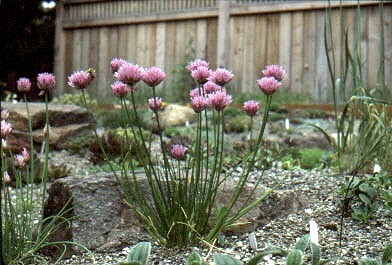 Allium hookeri var. muliense - A Chinese species, the variety muliense has bright yellow flowers instead of white. 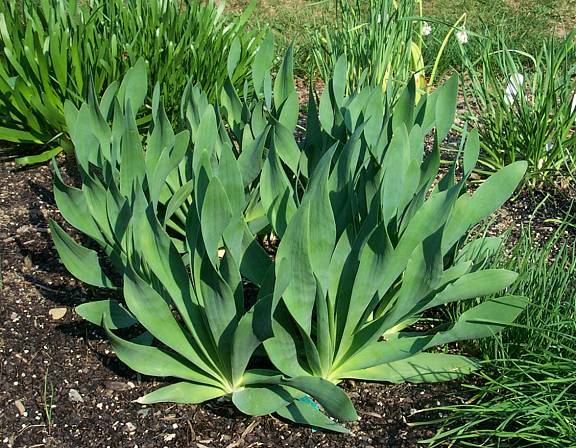 The foliage is very broad, with 8-9 leaves, looking more like a hemerocallis than an allium. The flowering stems reaches over 2' (60-70 cm), with a hemispherical head of flowers in June and early July. Three photos by Mark McDonough, June 2004. Allium hymenorrhizum "robust form" - I've grown several forms of this species, but this one from Jerry Flintoff is by far the most robust and distinctive. 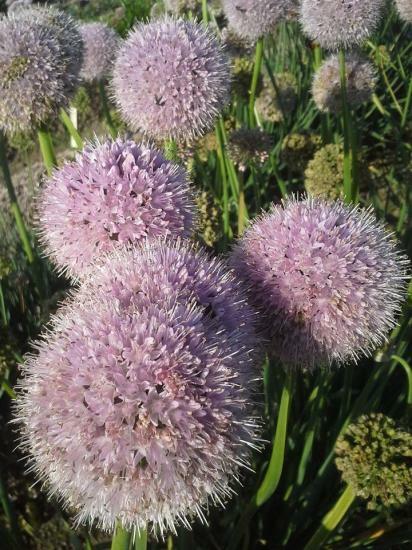 It grows 3' to 3-1/2' tall (90-105 cm) and has lollipop balls of lilac-pink blooms in early summer. The first photo shows a flower head with buds ready to open, the second shows flowers at full anthesis, and the third shows the succulent sprouting shoots in late March to early April, the leaf bases stained beet red and the emerging leaves strongly falcate. Photos by Mark McDonough. 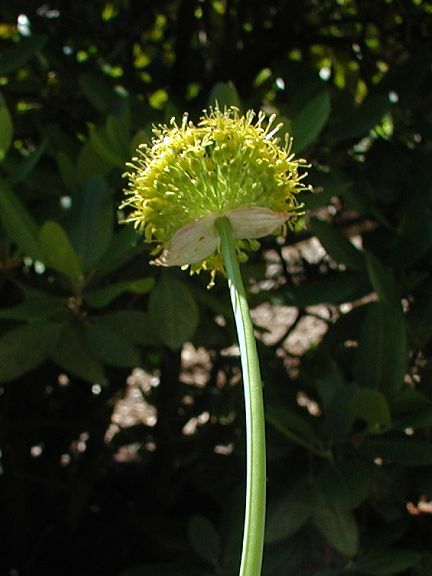 Allium incensiodorum was collected in Istria, northern Croatia, where it grows with Cyclamen purpurascens, Paeonia officinalis, Helleborus multifidus subsp. istriacus and other fine Mediterranean plants among limestone boulders. Leaves are strap-like. Flowers in mid August in cultivation in the UK. Photos by Tom Mitchell. Allium insubricum Boiss. & Reut. is found in stony ground at 800 to 2100 m (2500 to 6300 ft) in the Italian Alps. 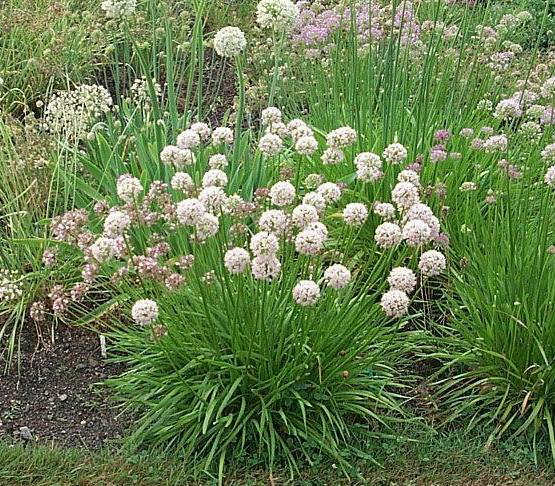 It is considered to be among the most desirable of Allium species. 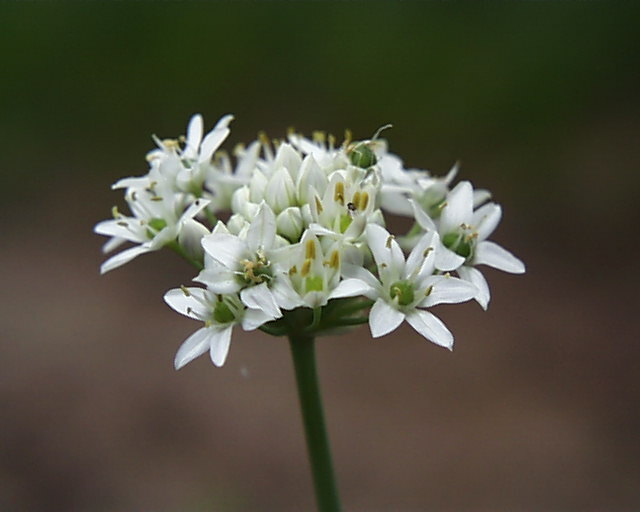 It is closely akin to the equally beautiful Allium narcissiflorum and seed purported to be the latter in seed exchanges is usually this species instead. (Seed heads of Allium narcissiflorum become erect; seed heads of Allium insubricum stay nodding.) It can be difficult to grow and flower well. First photo by Mark McDonough, taken in the garden of a nearby friend. Second photo of a pot grown plant in the UK by RH, sourced from Paul Christian. 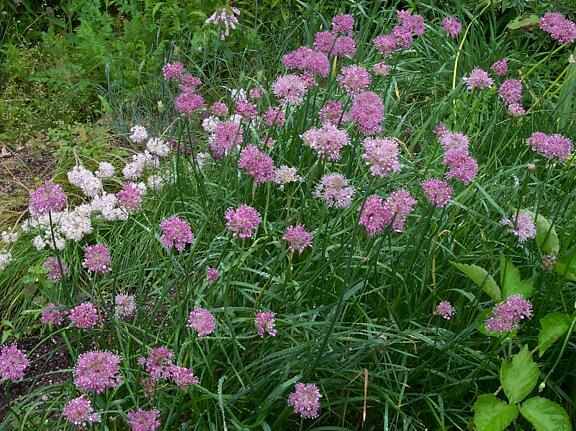 Allium lineare - There's much confusion over the status of the two names "strictum" and "lineare", but I'll go with the majority of thought on this one and use "lineare". 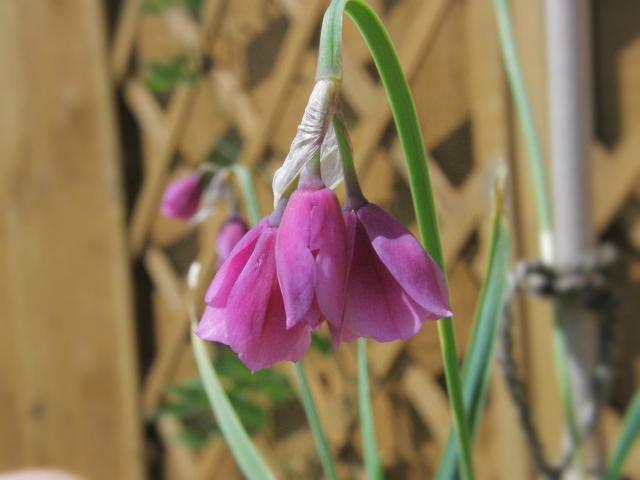 A pleasant easy to grow species that makes a bright show in shades of pink in early summer (June). 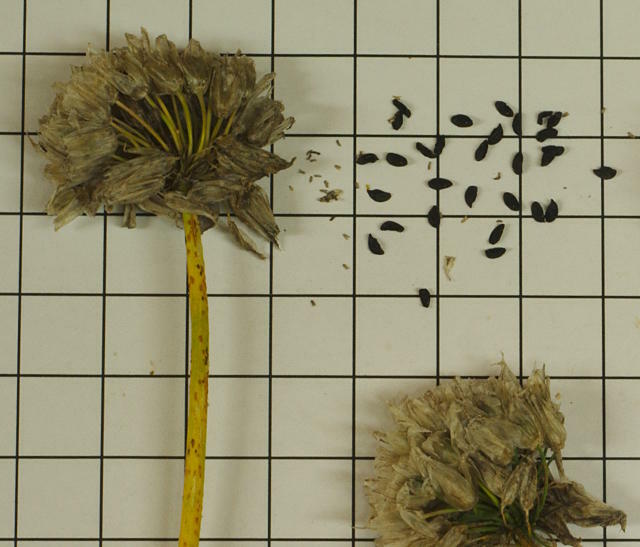 Seeds around a little too readily. Photo by Mark McDonough. 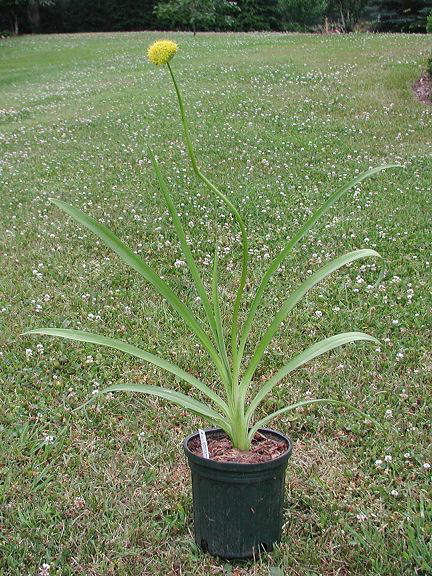 Allium nutans "extra-wide leaf form" - This Siberian species is a terrific plant. But it's a highly variable entity, and there are inferior forms as well as truly superior forms. 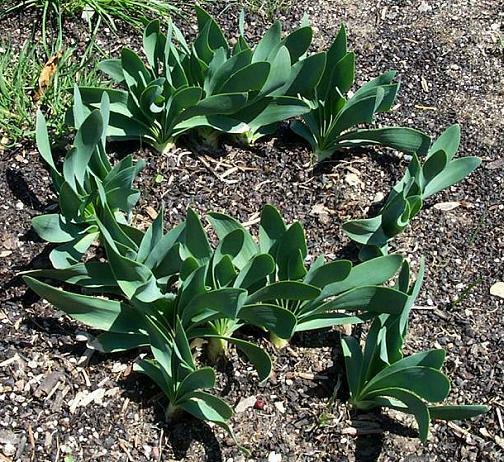 The one shown here is remarkable on account of the extra wide and thick gray leaves that spirally twist into impressive mounds. 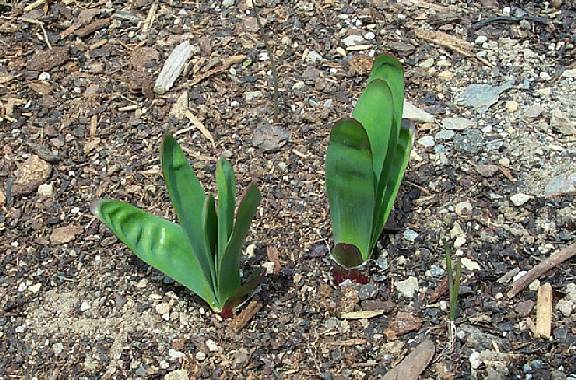 The first photo shows the plant in spring with the pirouetting rosettes of foliage, the second shows the massive muscular leaf rosettes in June, the third shows the nodding and twisting flower stems, and the last shows the typical flower form, dense floral globes that look fuzzy on account of the protruding stamens. Flower color can be found in all shades of rose, lilac, pink, to white. 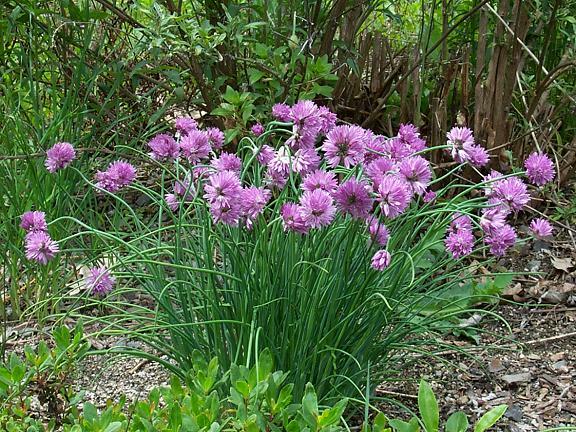 It is also one of the parents of Allium 'Sugar Melt'. Photos by Mark McDonough. A. nutans 'Caroline' is silver medal winning selection from the hands of P. de Jong. Early in the spring to develop the twisted light gray, 30 cm long leaves that remain into autumn. The flower buds have a nodding head, but in late June they turn up and open to lilac pink flowers. A. nutans 'Esmee' has flowers that are slightly larger and darker than those of 'Caroline' and leaves not twisted. A. nutans 'Isabelle' is a white flowered form, sometimes blushing pink. Smaller in all respects to 'Caroline'. 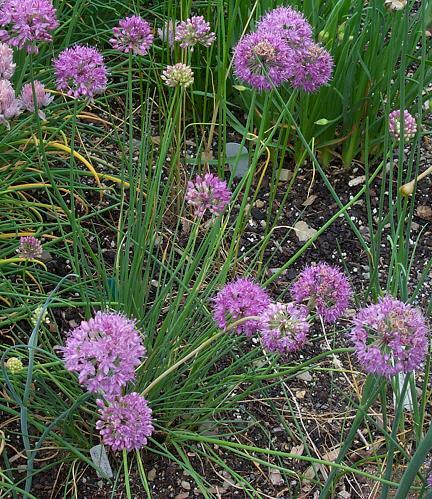 Allium przewalskianum is a delightful small species from Central Asia to China, with very fine terete foliage, good-sized balls of rose-purple flowers, and distinctive fibrous orange-colored bulb bases. The second photo is a clear close-up up the cinnamon orange bulb bases and white roots. Photos by Mark McDonough. Allium pumilum Vved. is a rhizomatous alpine species native to the Mongolian Altai region in Central Asia. The plants grow at an altitude of around 2800 m in dry tundras and in alpine grasslands in upper part of alpine belt. 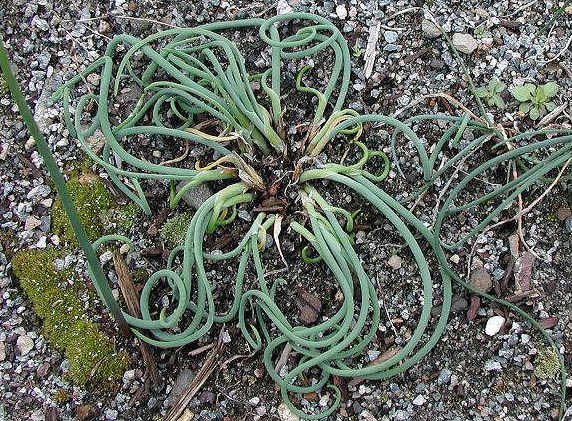 It is very similar to Allium amphibolum, but differs in the leaves are curved, straight with amphibolum (among other details illustrated in the link below). 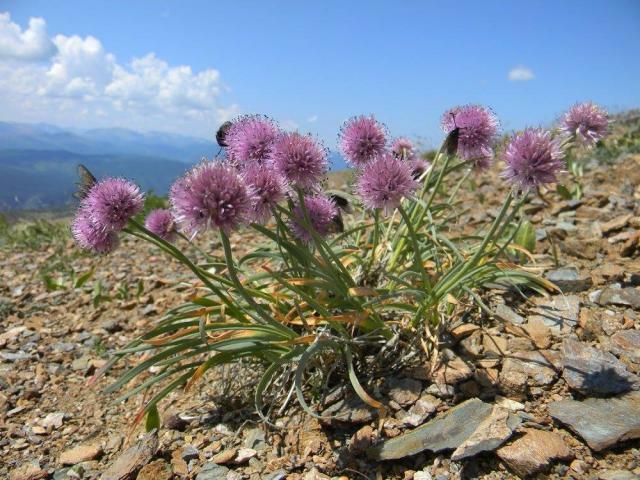 See a good description of the species here: Virtual Guide to the Flora of Mongolia: Allium pumilum. Photo by Andrey Dedov in the Altai Mountains. 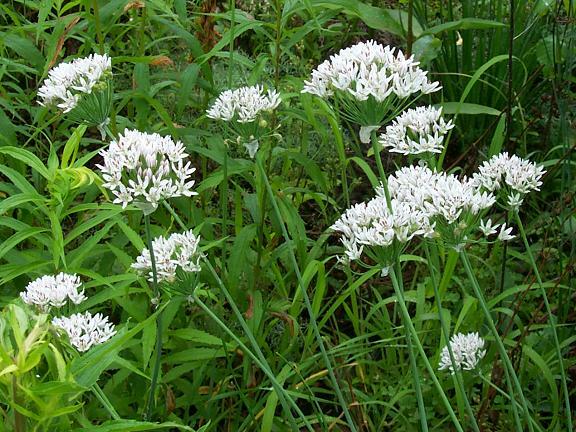 Allium ramosum is an early summer blooming species that is unnecessarily confused with Allium tuberosum. Flowering in June, stems can reach 3' (90 cm), with ample heads of nice white flowers, each tepal touched with a fine red nerves on the outside. This species has not been weedy nor aggressive like A. tuberosum. Photo by Mark McDonough. 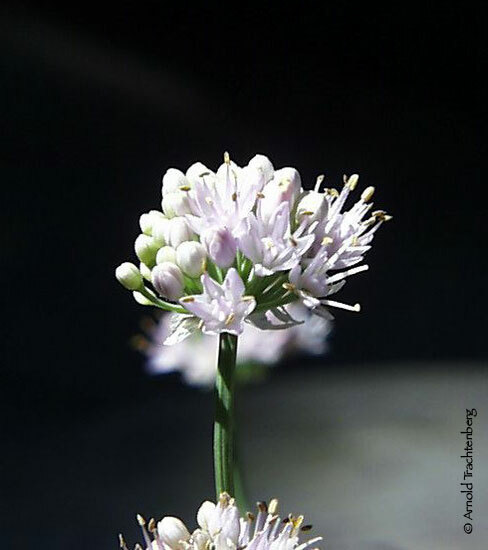 Allium rubens is a quiet, unassuming species from Central Asia. 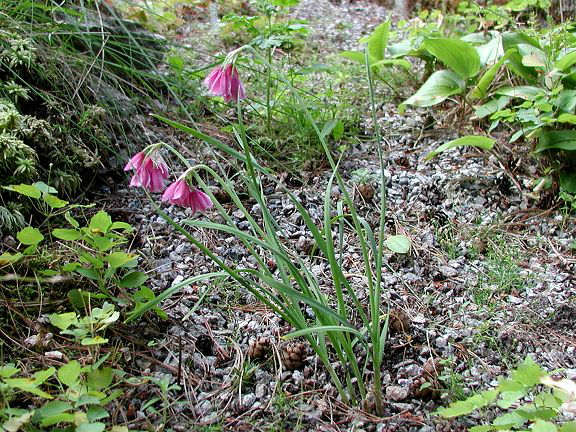 It has very narrow foliage, and little, few-flowered semi-nodding clusters of light pink bells. 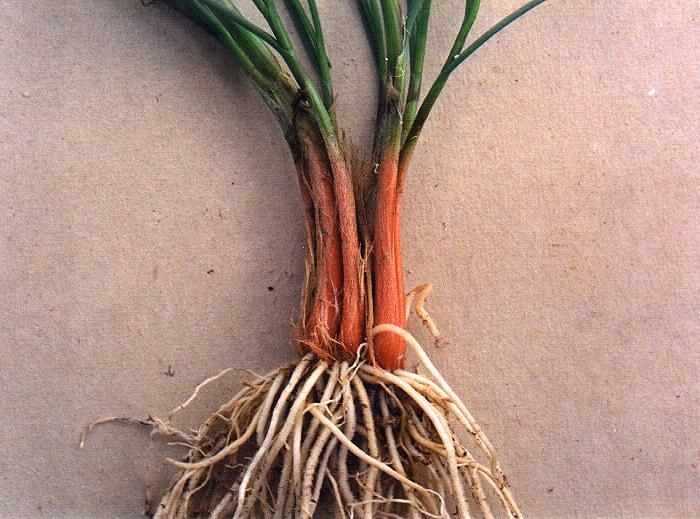 The roots and bulb base are also reddish pink color. It is one of the few "ever blooming" species, throwing up modest blooms all summer long. Drawing by Mark McDonough. 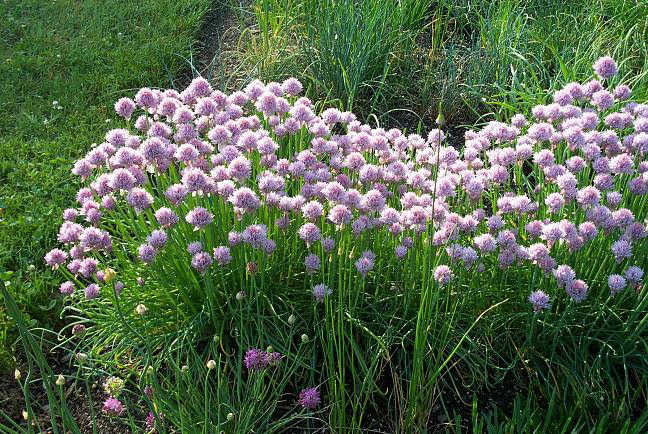 Allium schoenoprasum is the species known as chives. 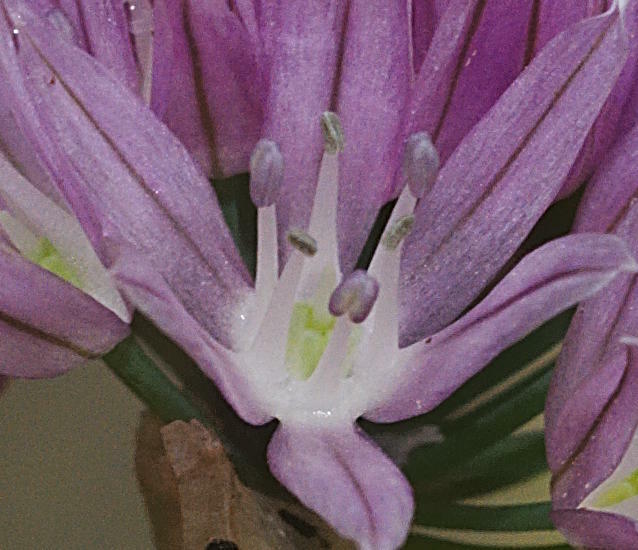 The range of chive forms provides a constant source of interest for this single species! In the first photo we see a semi-dwarf form, growing 10-12" (25-30 cm) tall, with informal jostled heads of lilac-purple. In the second there is a garden view showing an array of color forms from white, through shades of pink and mauve. Photos 1-2 by Mark McDonough. 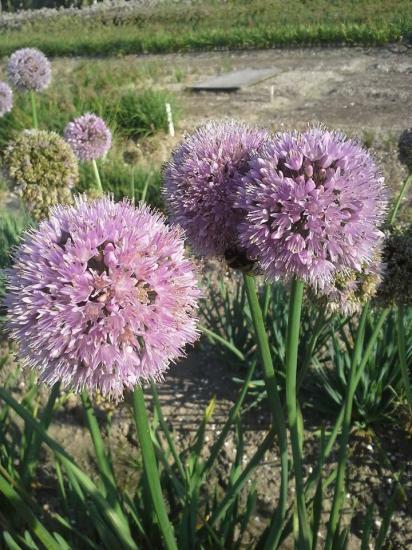 Photos 3-6 by David Pilling show a single flower which despite being small has the same form as all alliums, seed heads with seeds on a 10 mm grid, shoots appearing in March and buds in the middle of May. Photo of a mountain growing form from the Altai Region in Central Asia by Andrey Dedov. 'Curly Mauve' is a hybrid that I named, being one of the better "curly types" and a fascinating plant on many accounts. 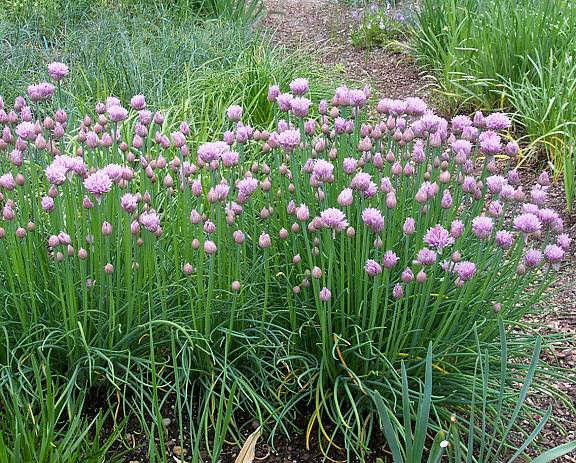 Many forms of chives actually have prostrate foliage; this one starts out prostrate, later becoming a misty blue-gray dance of medusa whips curling in all directions. 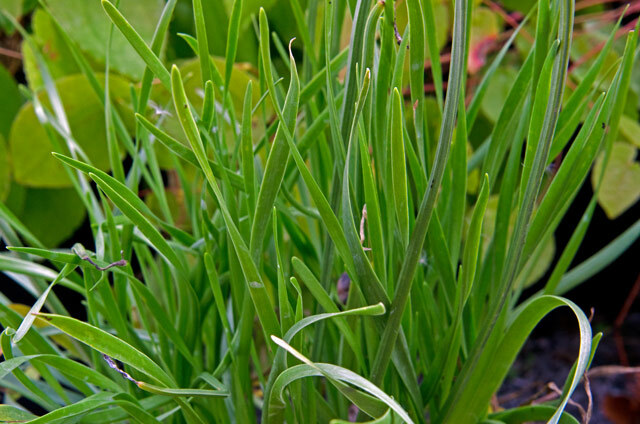 In June the stems stand erect above the short curled foliage to open a sea of grayed-lavender chive florets. The five photos below show a growth progression. Photos by Mark McDonough. 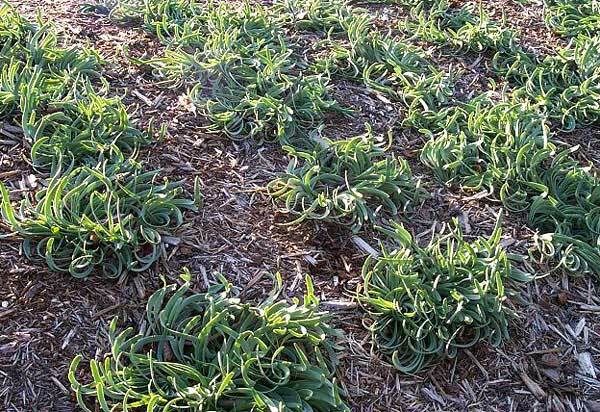 "Curly Mauve seedling" - Here we see a spontaneous garden seedling that caught my eye in early spring because of the octopus-like rosette, the blue-gray curled tentacles swirling around flat on the ground. Photo by Mark McDonough. 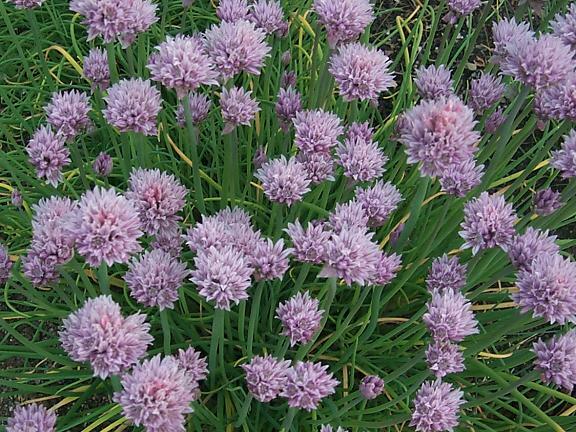 'Marsha' is a very deep purple form of chives, named for my friend Marsha Russell who had the deep form appear in her garden. I've had similar deep-color forms appear in the garden. 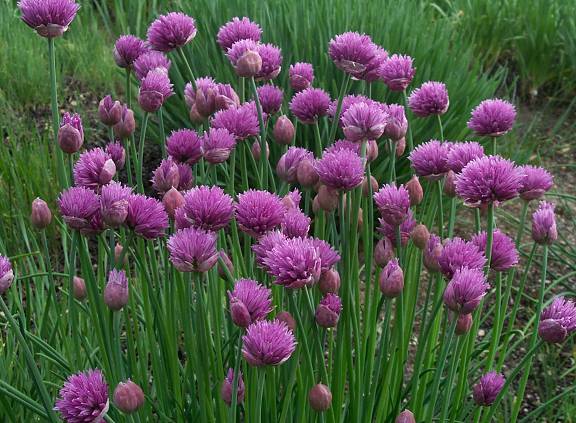 Seed grown plants will vary, but a good percentage will yield similar purple forms. Grows 2'(60 cm) tall. Photo by Mark McDonough. 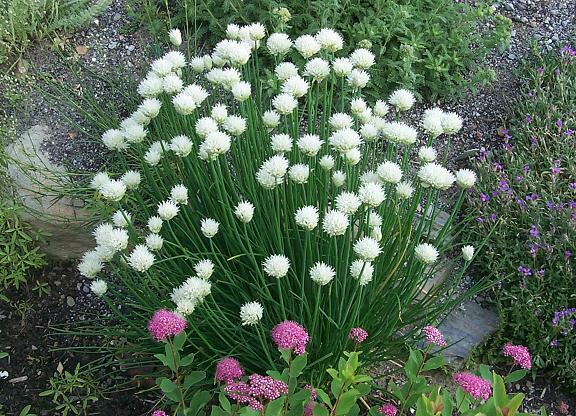 'Snowcap' (with American species Spiraea densiflora) - Lots of plants go around as Allium scoenoprasum 'Alba', but it's rather ridiculous given that numerous forms of chives, from robust 2' (60 cm) tall plants to little 6" (15 cm) dwarf forms, might have white flowers. It's better to give these various white forms cultivar names. This seedling that I selected and named was derived from another dwarf white cultivar (that I also named) called 'Corsican White', the latter a miniature white-flowered form from Corsica. The selection named 'Snowcap' is a semi-dwarf, growing 12"-15" (30-38 cm) tall, with pristine white flowers. Photos by Mark McDonough. 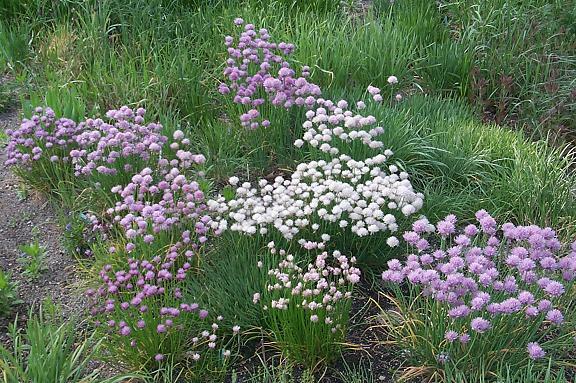 "Dwarf pinkish-mauve form from Corsica" - I received seed years ago of chives wild collected in Corsica. This was a very dwarf form, growing only 6-8" (15-20 cm) tall, with much sparser, very narrow foliage, slender stems and adorable little clusters of bloom in many colors. Subsequent seedling progeny has led to some very good selected forms. The photo is not very good, being a scan from a slide, showing a plant in the rock garden when I lived near Seattle, Washington. Photo by Mark McDonough. 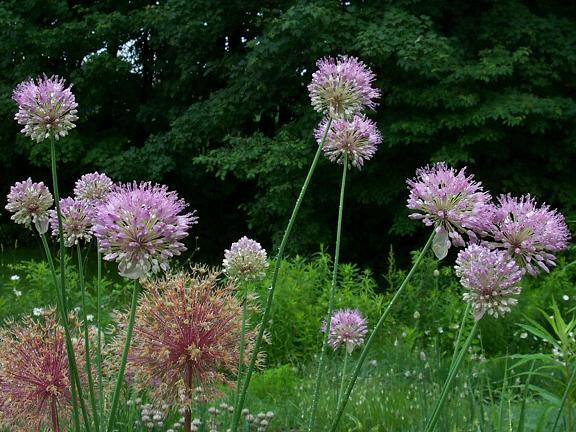 Allium senescens L. is native from middle, eastern, southeastern, and southwestern Europe into Russia and Asia. 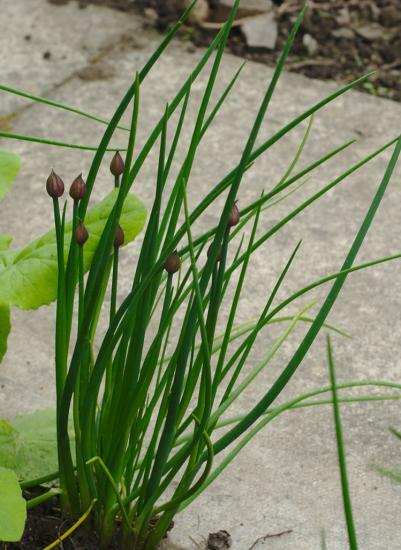 German garlic or broadleaf chives, as it is sometimes called, grows from a rhizome/bulb structure to between 8" and 40" in height. The foliage is thin, and strap like. The scape is solid, squarish. Along with A. nutans, they are the parents of the hybrid 'Sugar Melt'. 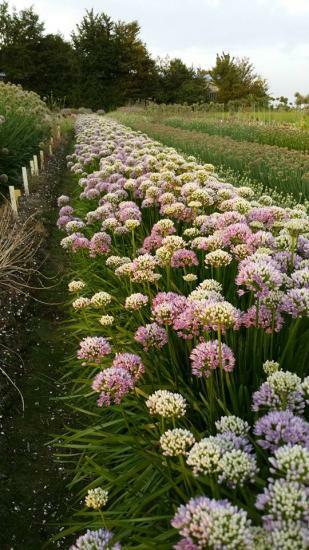 Photo by Wietse Mellema of a field of A. senescens in his bulb farm in the Netherlands. 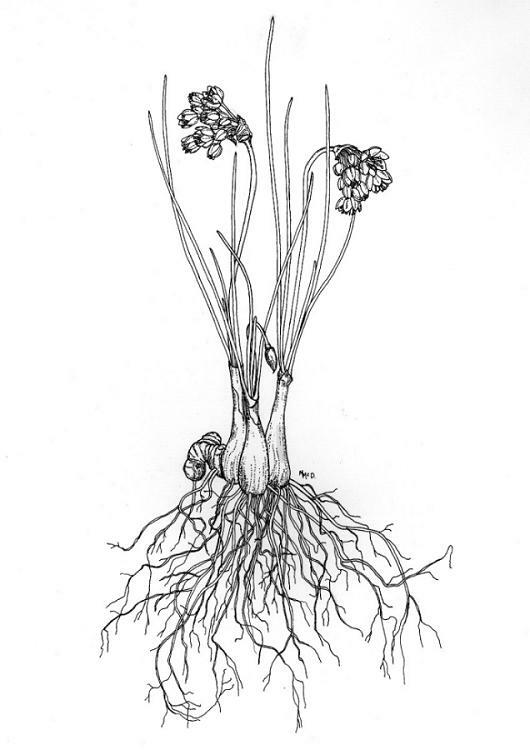 Allium senescens ssp. 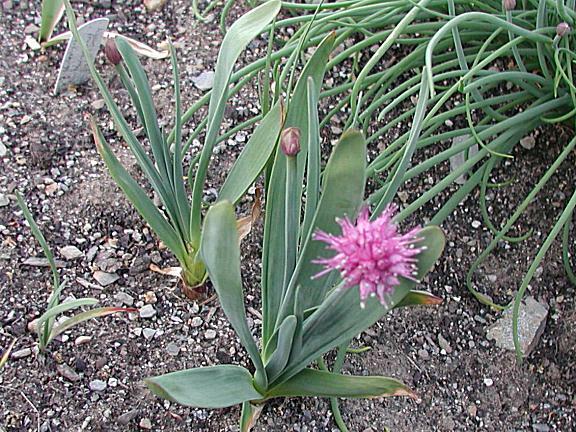 glaucum is a small, late flowering rhizomatous onion. 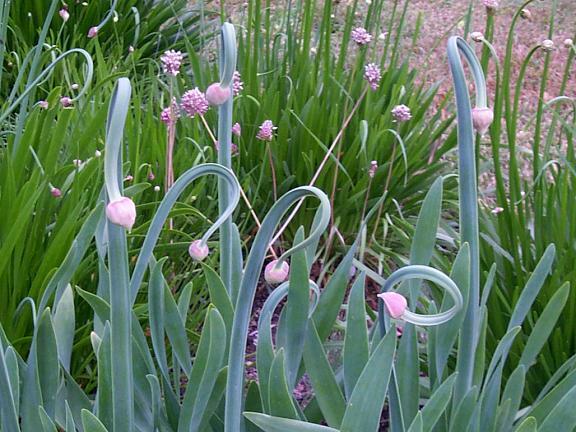 The "cowlick onion" or the "spiral onion" is well known in cultivation... or is it? 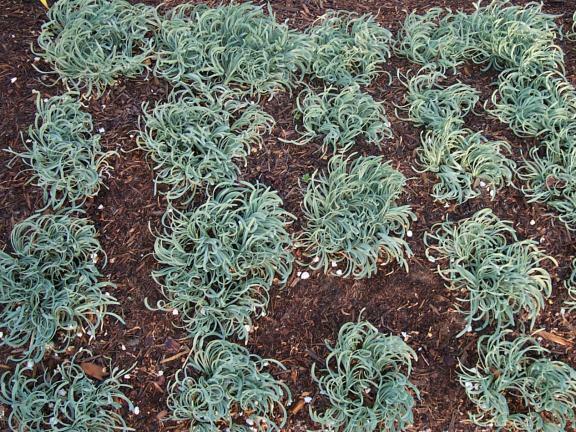 The horticultural entity known under the "glaucum" name is represented in cultivation by a whole range of grey-leafed, spiraling dwarf plants that flower in late summer to early autumn. Photo by Arnold Trachtenberg. 'Blue Eddy' is a seedling selected, named and photographed by Mark McDonough. The name is a fanciful allusion to the extra dwarf blue-gray swirls of foliage, like small swirling eddies of water. 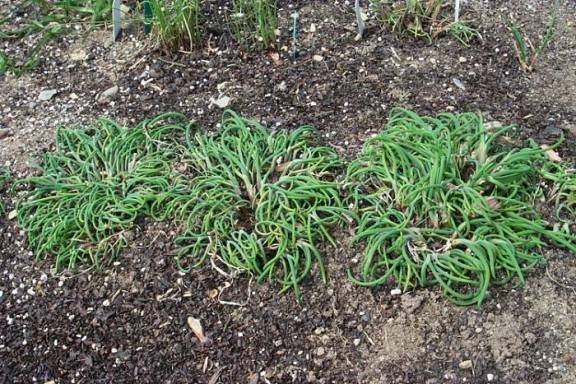 The plant is very effective as a ground-cover. Depending on the season and light from the time of day, the foliage appears grayish green to grayish-blue. 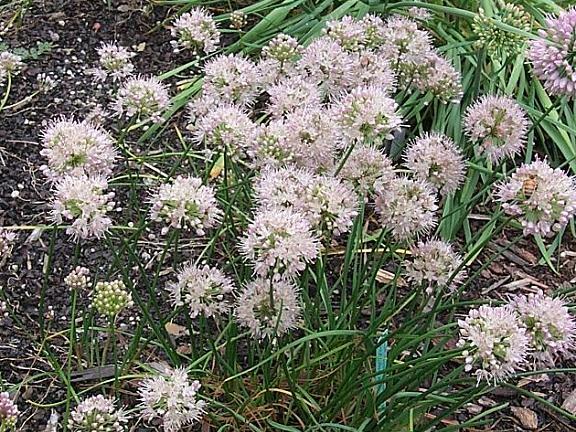 Autumn flowers are pale pink on 6"-8" (15-20 cm) stems. 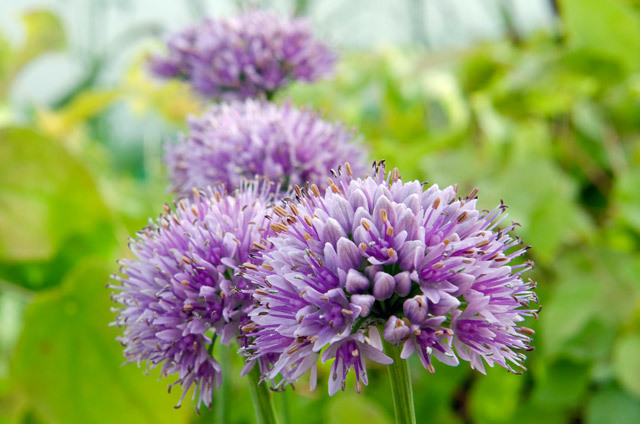 Allium togasii is one of the very best and most useful little onions. It's a Japanese species that flowers in late summer to early autumn, depending on the form grown. It prefers a sunny position in very sandy soil. 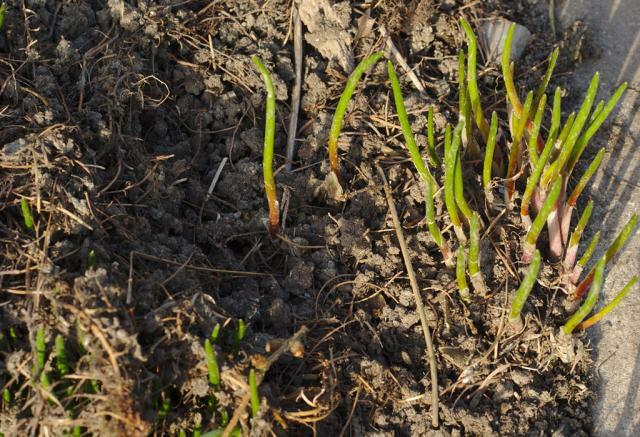 The first photo shows the grassy clumps of thread-thin foliage in spring. 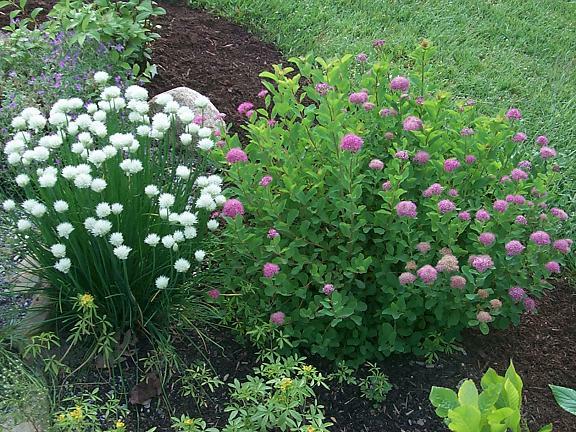 The second photo shows the plant in bloom, with spheres of palest pink in August on 4-6" (10-15 cm) stems. The foliage has most disappeared by the time the flowers arrive. Sometimes spelled A. togashii. Photos by Mark McDonough. 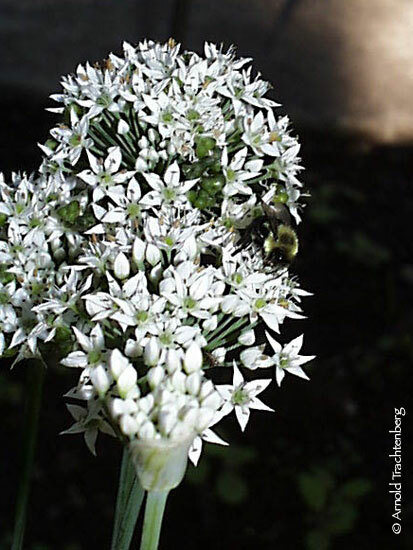 Allium tuberosum is a late-summer blooming species that's attractive in the garden or perennial border. 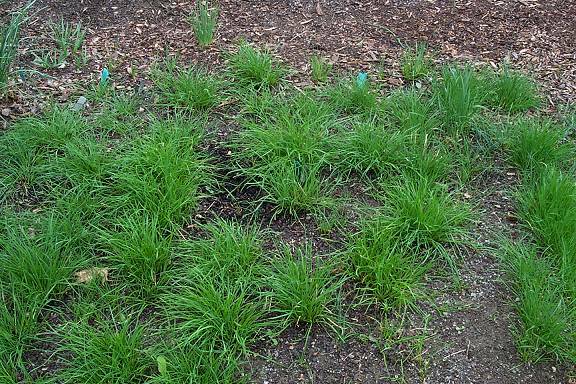 Be forewarned, it can be very weedy by overly aggressive self seeding, as reported by some growers, whereas other growers say it is well behaved. Possibly the climate and garden conditions affect its propensity for weediness. Photos by Arnold Trachtenberg. 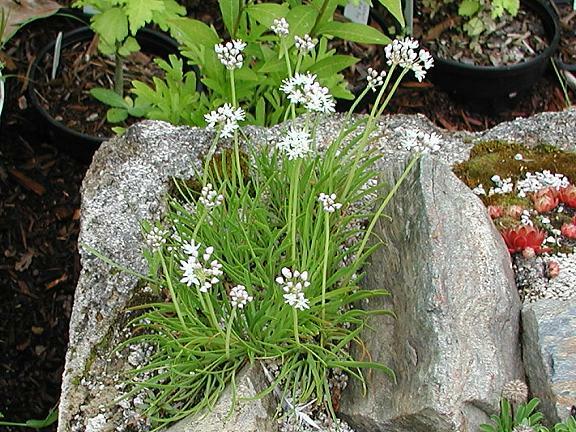 Allium tuvinicum - Named for the Tuva region of Russia, this is a small turf-forming species with narrow leaves and a long season of small creamy white flowers just clear of the foliage. The species has a wide distribution into Mongolia. Not exciting, but pleasant enough. Photo by Mark McDonough.